Call 360.671.3510 or contact us to schedule a private session with any 3 OMS teacher. Have a yoga session customized exactly for your needs with a private session. 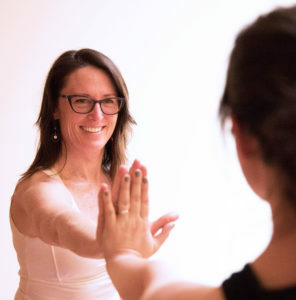 Sessions are tailored to your specific goals and can include restorative and dynamic yoga asana, pranayama, meditation, mindfulness, and more. Individual lessons provide a safe environment with the specific attention needed when recovering from illness or trauma. They are also a gentle way to begin your yogic journey if joining a class feels vulnerable. work with specific topics such as anxiety, insomnia, grief, and more. Couples/partners private sessions for two individuals, family members, or friends are also available. Enjoy the benefits of practicing yoga together. Would you like to have a 3 OMS teacher lead a yoga class for your private off-site event? Contact us for info on rates and availability. Yoga therapy sessions are available with Cat Enright C-IAYT. Cat is a Certified Yoga Therapist through the International Association of Yoga Therapy, which represents 800 hours of training and mentorship. Her background in Iyengar Yoga for the past 25+ years prepared her for this new area of study and practice. In addition to working with private students on their physical issues, she helps her clients explore the emotional, mental, and spiritual aspects of illness, trauma, or injury. She draws from yoga’s wide range of practices to meet these issues during private sessions and to craft sequences for home practice. Clients’ healing progresses by working simultaneously with the subtleties of mind, body, and heart connections. Learn more about Cat and Yoga Therapy here.